Public release of a 20-year collaborative effort to devise a unified and consistent national reporting system for plant communities opens new avenues for broad-scale and long-term analyses of landscape change. 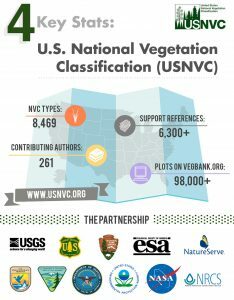 The U.S. National Vegetation Classification (USNVC), a reporting standard organized around ecological principles for the study of plant communities, launches today. It is the first classification of its kind designed to adapt to new ecological knowledge and expand to absorb new vegetation types. The organizing framework of the classification helps independent and federal scientists speak the same language, whether they monitor the high elevation red spruce forests of the Great Smoky Mountain National Park or conduct broad scale analyses of forest trends across the North American continent. “As the lead agency for the Federal Geographic Data Committee (FGDC) Vegetation Subcommittee, the U.S. Forest Service is thrilled to see the release of the U.S. National Vegetation Classification. This is the culmination of two decades of effort from a dedicated and highly collaborative team representing the academic sector, non-governmental organizations, state agencies, and numerous federal agencies. 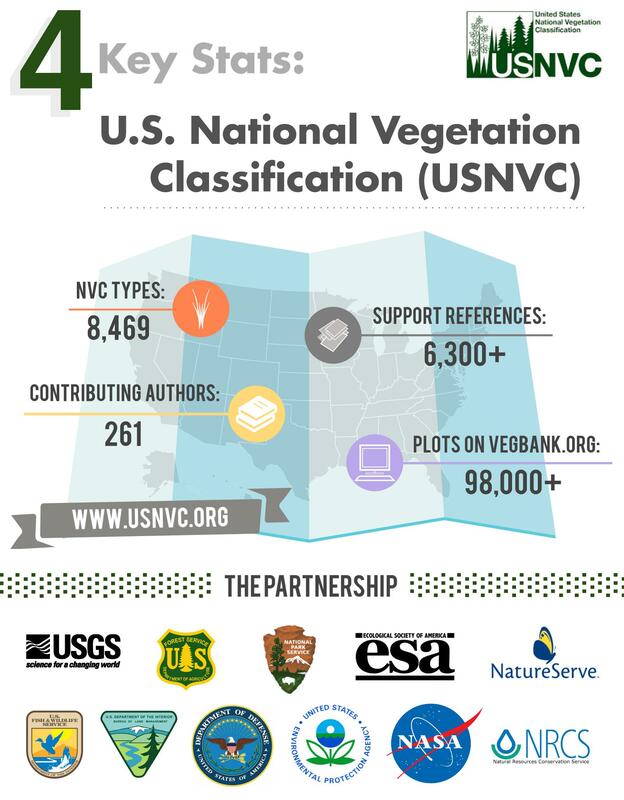 The USNVC fills a critical need for a standardized system for vegetation classification that will allow land managers to collaborate across ownership boundaries and manage and identify trends on a landscape, regional, and national scale. In the past, the many uncoordinated classification systems that were used prevented us from being able to compare and analyze vegetation, except on a local level and within individual land ownerships. This great achievement allows us to have a common language. I really appreciate the dedication of all those who made this possible,” said Carlos Rodriguez-Franco, acting deputy chief for R&D at the U.S. Forest Service. The Ecological Society of America’s (ESA) Panel on Vegetation Classification has worked to ensure the scientific rigor of the classification and facilitate the classification’s development, collaborating with NatureServe, the U.S. Forest Service, and the U.S. Geological Survey to form a U.S. National Vegetation Classification partnership. These agencies, along with the National Park Service, Bureau of Land Management, and others, continue to fund ongoing peer-reviewed revisions. “We call it the eco-veg approach. The idea of the classification’s hierarchy is to reflect the functional ecology of plant communities. The eight levels of the hierarchy are organized around ecological concepts at different scales and can be refined or expanded as new information emerges from ecological research,” said Don Faber-Langendoen, editor-in-chief of the US National Vegetation Classification and a senior research ecologist at NatureServe. The classification has two categories, which both use an 8-level organizational hierarchy: a “Natural” hierarchy, for plant communities primarily influenced by ecological factors, parallels a “Cultural” hierarchy, for plant communities shaped by human activity. The National Vegetation Classification provides a common rubric for reporting data about public lands, but federal agencies can preserve their own classification systems. The new classification is designed to “cross-walk” to other classification systems, identifying equivalent types when possible. Vegetation types are best typified by collecting quantitative field plot data that record plant species, vegetation structure, and site factors. People from a great diversity of environmental sectors collect plot data, employing diverse databases and protocols. Bringing these data together in a consistent and well documented format was and continues to be a major challenge of the project. “Historically, vegetation classifications were built by field scientists with a lot of experience. The problem is that it was too subjective. Another scientist could not look at the classification types and replicate the methods used to derive them. The National Vegetation Classification is based on standardized, rigorous data rather than just subjective opinion. The plot data is publically available so that anyone can go back and see it, and the classification can be revised and improved moving forward,” said Robert Peet, a professor at the University of North Carolina at Chapel Hill. Peet was among the instigators of the new classification and has served on ESA’s Panel on Vegetation Classification since its inception, in 1995. In the Natural hierarchy, the top most coarse-grained three levels (class, subclass, formation) describe major structural categories on a global scale, such as tropical forest, warm desert, and temperate grassland. The middle levels (division, macrogroup, group) reflect distinctive combinations of species in the context of regional to continental scale climate, geology, and water cycles, and disturbance patterns of fire, wind, and flood. Mid-levels include ecosystem categories familiar to ecologists, like Caribbean mangrove forest, tall grass prairie, or Great Basin sagebrush steppe. The composition of species largely defines the lowest, most fine-grained levels (alliance, association), distinguishing, for example, between forest dominated by black mangrove versus red and white mangrove. The Cultural hierarchy is organized by type of human manipulation at the top levels, capturing agricultural lands, reclaimed farmlands, and urban parks. Mid-levels are defined by climate, plant taxa, and specifics of the disturbance, such as temperate row crops or tropical orchards. The low levels are defined by most common species and appearance, describing sweet corn or banana crops, for example. At both broad and fine-grained scales, the classification adopts traditional, widely shared concepts, with terminology that often dates to the early 1900s, but unites these concepts into an effective, coherent system. The ESA Panel on Vegetation Classification will manage the peer review process for revisions and additions to the classification. Established by the Ecological Society in 1995, the panel developed the standards for plot-based survey methods and the peer review system for revising the classification. The panel represents the expertise of professional ecologists spanning academic, agency, and non-governmental sectors and acts as a forum for debate on scientific issues relating to vegetation science and taxonomy. It maintains VegBank, a public data archive for storing, sharing, and displaying information on vegetation types, including the multiple kinds of vegetation plots now being employed in the classification enterprise. Nearly 100,000 plots have already been archived—a good start, say panel members, but only a fraction of what is needed to represent the diversity of vegetation in the U.S.
“Proposals for classification updates are submitted to a peer review process, much like articles are peer-reviewed for publication in a journal, but because we’re maintaining a system, we have to consider how individual changes or additions will affect the whole. If someone wants to change Mangrove types, we have to be sure that it doesn’t conflict with tropical forest swamp types,” said Faber-Langendoen. The panel expects that the lower levels will generate most input and review. The fine-grained, lower levels have also received the least scrutiny and review so far. Levels 5-8 will only change, at most, every five years. “People need assurance that it’s stable enough to work with and doesn’t go out of date before you can use it. Thankfully, we’re now at that point,” said Faber-Langendoen. The National Park Service has taken the lead in putting the National Vegetation Classification into action for its inventory and monitoring program. The Park Service has inventoried 159 parks, preserves, and other lands under its administration using the classification, and has 88 projects in progress. The Landscape Fire and Resource Management Planning Tools (LANDFIRE) program of the U.S. Department of Agriculture Forest Service and U.S. Department of the Interior is working to cross-walk their classifications based on NatureServe’s Ecological Systems to the group and macrogroup levels of the National Vegetation Classification, which will allow USNVC vegetation plot data to contribute to LANDFIRE’s nationwide mapping efforts. Faber-Langendoen and his colleagues hope the launch of the classification will bring it to the attention of a broader section of potential users and draw input from academics, consultants, and other as yet untapped environmental professionals.